I suspect this is called Christmas Chutney because of its festive red and green colours and it is a perfect complement for the cold cuts and cheese at tea-time on Christmas Day and throughout the festive season. It is very spicy so if you want a less hot version then halve or even quarter the cayenne pepper. It would also benefit from the addition of some raisins or sultanas, a seasonal ingredient and often added to chutney: perhaps in place of one of the red peppers, say 125g/4ozs. 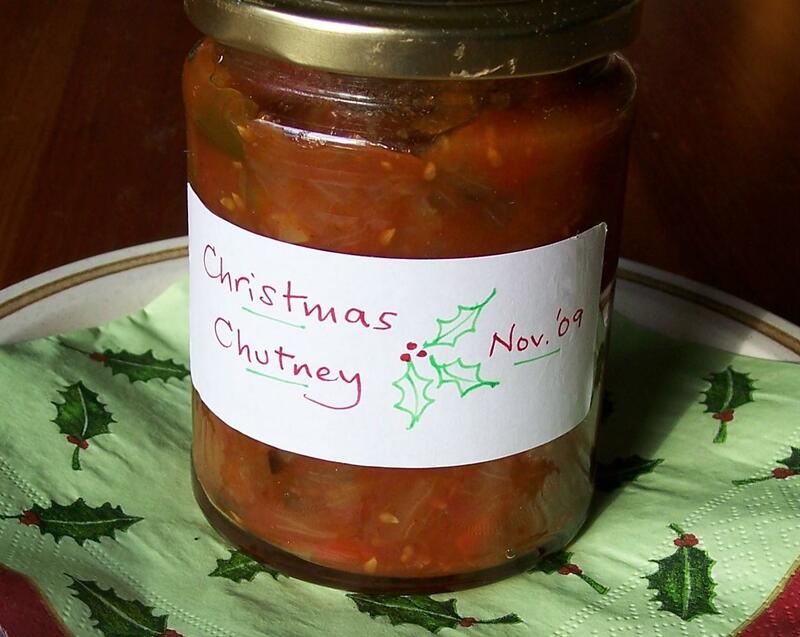 The recipe came from our friend Shirley as an extra when I asked for some of her chutney and relish recipes. The book she lent me contained a clipping for this Christmas Chutney taken from Candis magazine, November 2004 issue. She hadn’t got round to making it, so I gave her a jar when I returned the book. 1. Peel the tomatoes by making a cut in each, plunging them in a bowl of hot water for about 30 seconds and then draining and covering with cold water. The skins should slip off easily. 2. Chop the tomatoes, aubergine, peppers, onions and garlic. Place these into a large heavy based pan and bring to the boil. Cover, turn down the heat and simmer for 1hour, stirring until the vegetables are tender. 3. Add the vinegar, sugar, salt, coriander, paprika and cayenne. Bring to the boil, stirring until the sugar has dissolved. Boil for about 30 minutes or until the chutney has a chunky consistency and the watery liquid has evaporated. It is important that the chutney is stirred occasionally to make sure that the mixture does not stick, especially towards the end of the cooking time when it could burn. 5. Pot the chutney into the prepared jars sealing while still hot. Cool and label. 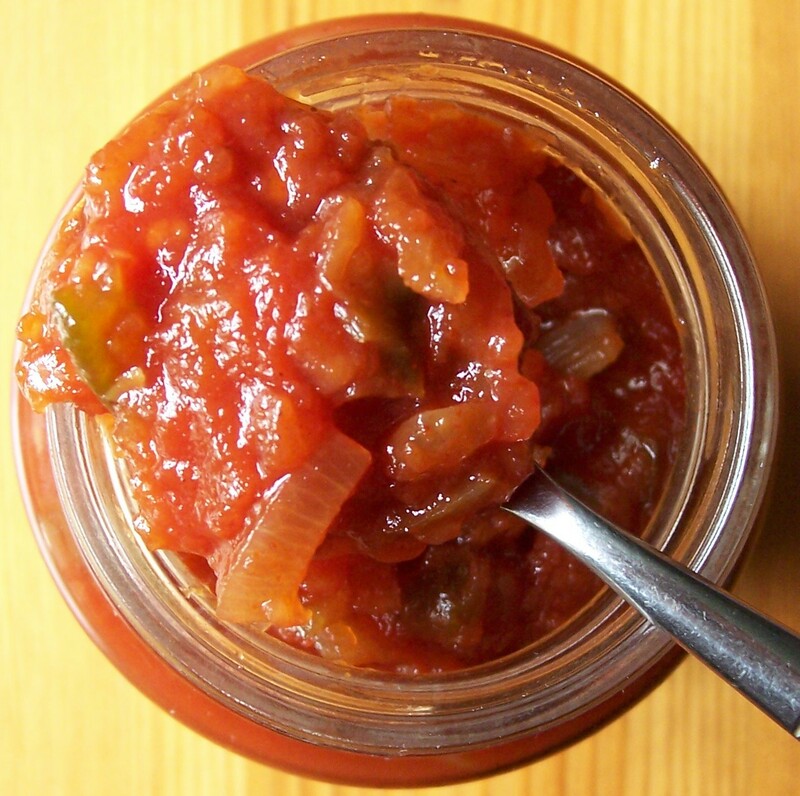 This red pepper chutney is a sweet and sour relish which can served at dinner with sausages or home-made burgers, or at lunch time with cheese or cold meat and crusty bread. 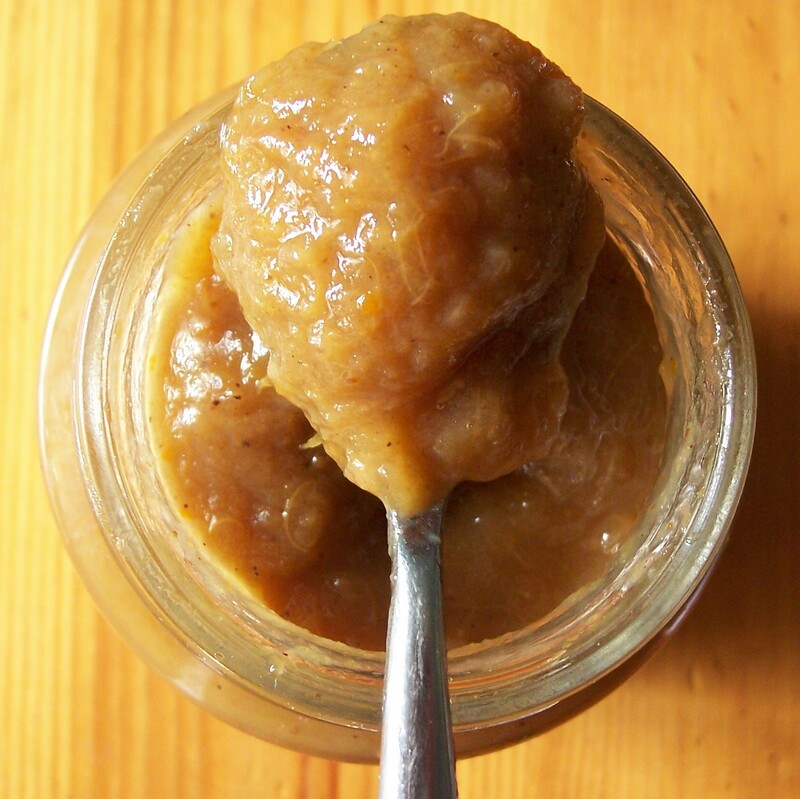 It can be made at any time of year as the ingredients are easy to find, although it is good idea to make a quantity in the Autumn when there are plenty of apples available. The recipe comes from a great little book I bought many years ago called A Pocket Book on Pickles & Preserves: techniques, hints & recipes by Olive Odell, which I always turn to first when hunting for a pickle or preserve recipe. 1. Pour boiling water over the peppers, leave for 1 minute and then drain. 2. Place drained peppers in a pan with the apples, onions and garlic and cook gently until tender. 3. Stir in the vinegar and sugar and continue to cook until thick, stirring occasionally. 4. Wash the jars well and sterilise. I usually do this by filling the jars with boiling water and putting the lids in a bowl of boiling water. I pour away the water just before filling each jar and immediately take the lid from the bowl and screw it on. Pot the mixture into the warm jars and seal. 5. Store for 4-6 weeks before serving. Out for the day in the middle of rural Oxfordshire, we pulled off the road to eat our sandwich lunch. I spotted a tree in the hedgerow nearby with, sadly, just a few damsons left very high up but nevertheless went to investigate. I was sure someone had beaten us to it, but when I got there I found the ground below the tree thick with fallen damsons. We filled our sandwich container and a few other bags and boxes we had to hand with the ripe and juicy fruit. What on earth to do with such a large harvest, I wondered. Crumbles, of course. Jam possibly? 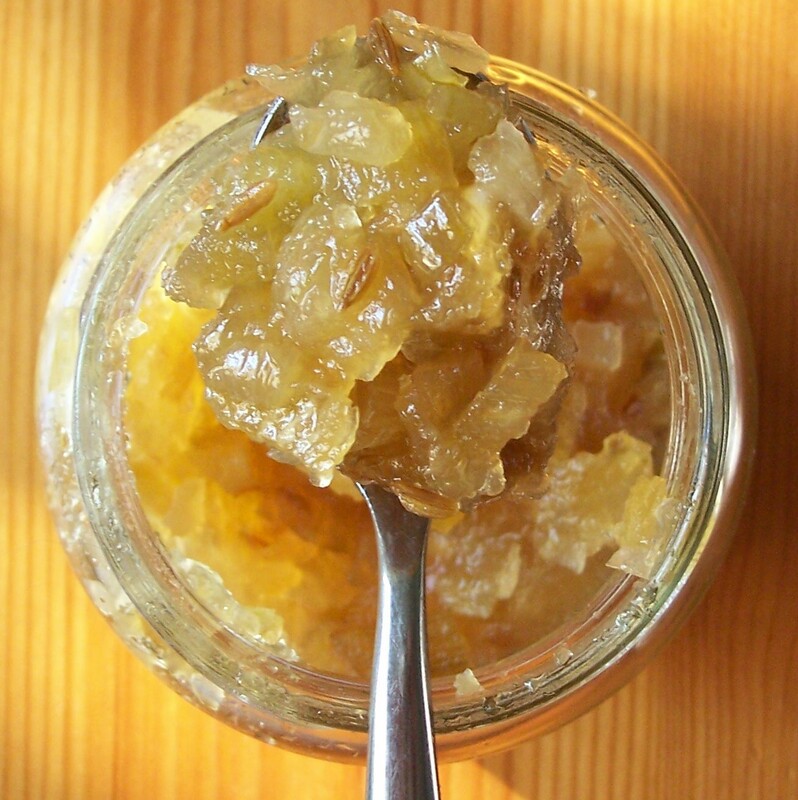 Once at home I did some searching and came across this delicious chutney in Delia’s How to Cook: Book 3 (Pub: BBC) – Delia Smith comes up trumps yet again! (The recipe can also be found on Delia Smith’s website.) I thought I would try just a half quantity the first time, but I would not hesitate with making the full amount next time. … and there will be a ‘next time’. (Actually I have put some Damsons in the freezer so if needed I could make some more this year.) My only variation to the original recipe was to add the sugars right at the end of the cooking time, something I do regularly. This allows more of the vinegar to boil away, meaning the sugar is less likely to over caramelise and give the finished chutney a burnt taste. 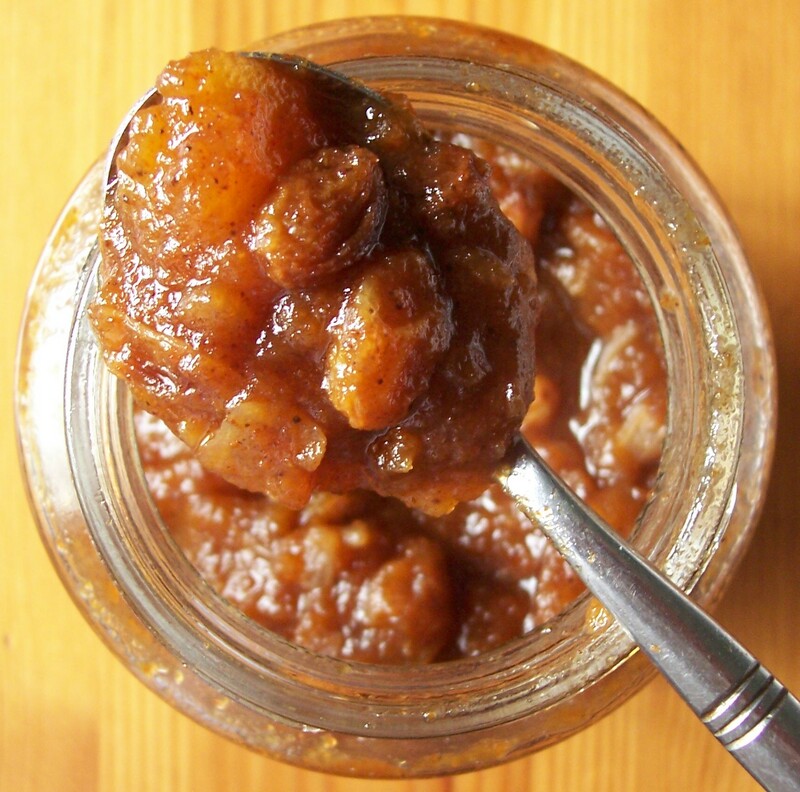 It also means that the finished chutney retains a better and lighter colour. My half quantity made nearly 3 x 1lb jars, so the full quantity given below would make about 6 x 1lb jars. 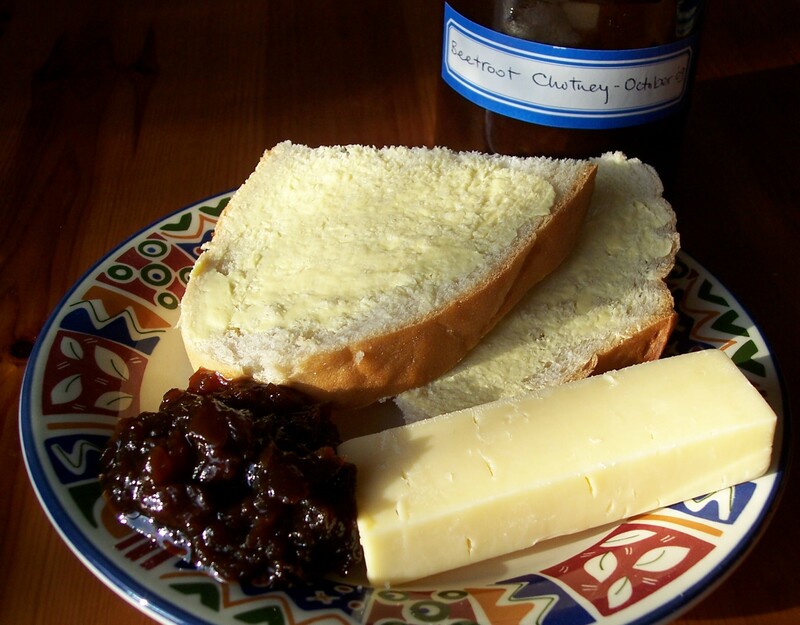 This spicy, plummy chutney is delicious served with cheese and cold meats. We have made a note of the location of ‘Plum Corner’ (as we have named our picnic spot) and plan to go back there another year! having counted the number of damsons you use, stew the fruit gently with 225g/½pt of the vinegar for about 20minutes and then remove the stones from the pan with a fork, making sure you have accounted for them all. 2. Place the stoned damsons, whole or pre-stewed, in a large preserving pan or heavy based saucepan. Leaving the apples unpeeled, remove their cores, finely chop them and add to the pan. Peel and finely chop the onions and add to the pan. Crush the garlic cloves thoroughly and add to the pan. 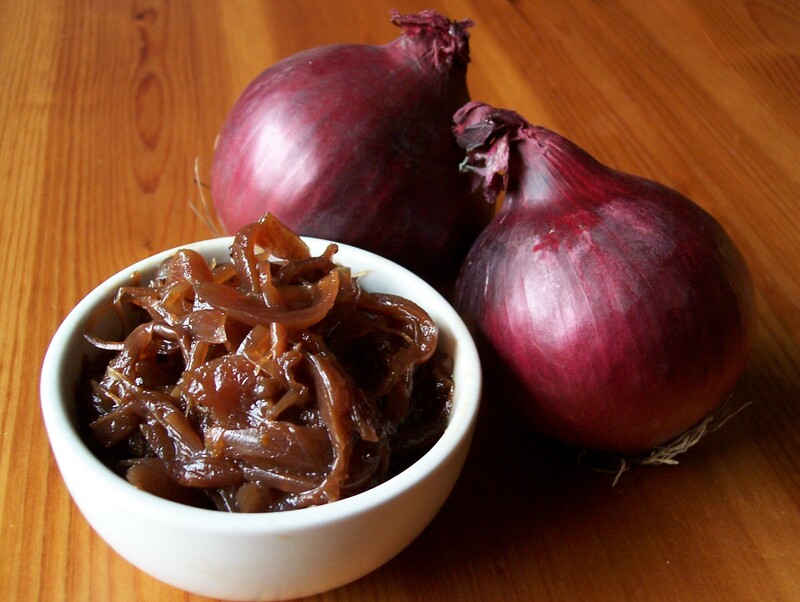 Add the ginger, raisins and vinegar – or remaining vinegar if you have already part stewed the damsons. 3. Tie the cinnamon sticks, allspice berries and cloves in a piece of muslin – I knot them into a length of leg and foot cut from a clean old pair of tights. Tie with some string onto the handle of the pan and suspend the package in the chutney mixture. 4. Bring the mixture in the pan to the boil and lower the heat. Simmer very gently for 2-3 hours. Stir occasionally, particularly towards the end of the cooking time when the chutney is more likely to stick. 5. When almost all the vinegar has disappeared, stir in the sugars and make sure they are well dissolved. Continue to cook and when the chutney has thickened to a soft consistency and where you can draw a channel in the mixture so it leaves an imprint for a few seconds which does not fill with vinegar. 6. Wash the jars well and sterilise. I usually do this by filling the jars with boiling water and putting the lids in a bowl of boiling water. I pour away the water just before filling each jar and immediately take the lid from the bowl and screw it on. 7. Cool, label with the contents and date of making. Keep in a cool cupboard for 2 and preferably 3 months before eating so the flavours can develop.